In this draw poker game, you are dealt 5 cards and have to choose which ones to keep. Discard the rest and press 'Deal' to get new ones. If you have a pair of Jacks or better, you win.The more coins you bet, the more you win. One hand that can be played for 5�, 25�, 50�, $1 and $5. Click on 'pay table' and look for the column highlighted based on the amount of coins played. Click on the coin slot in the bottom right corner to insert single credits into the machine. Hands are ranked using the pay table. Cards are dealt from 1 deck. Cards are re-shuffled for each hand. You can discard up to 5 cards. You win if you have at least a pair of Jacks. Bet - Used to bet 1-5 coins after they have purchased credits by clicking on chips. Bet One - Bets one coin each time it's pressed, up to a max of 5 coins. Bet Max - Bets 5 coins and starts the deal. Draw Deal - Deals the cards after a bet has been placed or after put on hold. Hold - Used to keep the cards in hand. 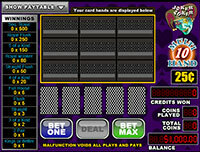 Cash Out - A red button used to stop playing and cash out credits and winnings. Payout - Payouts are based on the pay table. When playing 3 hands, click on 'Pay table' to see the highlighted column in the payout table for payouts. Bet 1�, 5�, 25�, 50�, or $1. Your cards will appear. Other cards are drawn randomly to fill the rest of the spots. Once cards have been discarded they won't appear in any following hands. You must have at least $5 in your account to play multi-hand video poker. When playing 10 hands, click on 'Pay table' to see the highlighted column in the payout table for payouts. Bet of 1�, 5�, 25�, 50�, or $1. Choose 52 hands and a bet of 1�, 5�, 25�, 50�, or $1. When playing 52 hands, click on 'Pay table' to see the highlighted column in the payout table for payouts. Joker Poker is a game of draw poker. The player receives five cards from the dealer; the player then chooses which of the cards to keep or "hold". Then discards the remaining cards for new ones by pressing deal. The final hand is determined a winning hand if the player has Kings or better. There is also a special payout for having 5 of a kind, or Wild Royal with Joker. Also, Jokers's are wild and can be used to create other winning hands. Playing more coins increases the payouts on winning hands. There is a special payline in the paytable for 5 of a kind, having a Royal Flush using a Wild Joker, and a dealt Sequential Royal Flush (10, J, Q, K, A from left to right). "Hands are graded based on the pay table. "Cards are dealt from a single deck. "Cards are re-shuffled each hand. "The player has the option to discard up to five cards. Player Wins if: The final hand is at least a pair of Kings. Player Loses if: The final hand does NOT meet the minimum hand of at least a pair of Kings. 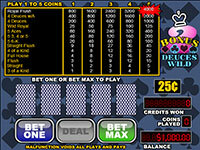 Each Video Poker game that consists of one hand can be played for $0.05, $0.25, $0.50, $1, and $5. You can click on the 'Pay Table' button to view the payout table and the proper column will be highlighted based on the amount of coins played. 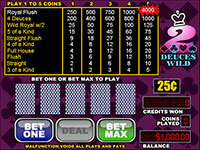 Single credits can be inserted into the Video Poker Machine by clicking the coin-slot in the bottom right corner. "Each Video Poker game that consists of three or more hands can be played for $0.01, $0.05, $0.25, $0.50, and $1. In addition, players can choose from 3 hands, 10 hands, 52 hands or 100 hands. If you are playing a game that consists of three or more hands, you can click on the 'Pay Table' button to view the payout table and the proper column will be highlighted based on the amount of coins played. "In each of the hands played by a player, the cards held by the player appear. Cards are drawn randomly to fill the rest of the spots. Once a card or cards have been discarded by the player, the card or cards cannot appear in any of the subsequent hands. "You must have a $5 account balance to play multi-hand video poker. Bonus Deuces Wild is a game of draw poker. The player receives five cards from the dealer; the player then chooses which of the cards to keep or "hold". Then discards the remaining cards for new ones by pressing deal. The final hand is determined a winning hand if the player has a 3 of a kind or better. There is also a special payout for having 5 of a kind, Wild Royal, 4 Deuces, 4 Deuces with an Ace. Also 2's are wild and can be used to create other winning hands. Hands are graded based on the pay table. Cards are dealt from a single deck. Cards are re-shuffled each hand. The player has the option to discard up to five cards. Also 2's are wild and can be used to create other winning hands. Please see the pay table on the current machine for more information. The final hand is a hand of at least 3 of a kind. The final hand doesn't have at least 3 of a kind. 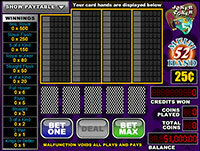 Bet - The player purchases credits by clicking on chips to put into the game, then decides whether to bet 1-5 coins, each increasing the payout for a winning hand. 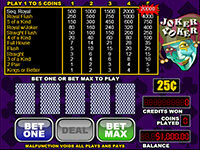 Bet One - Clicking 'Bet One' bets one coin each time it is clicked up to a maximum of five coins. Bet Max - Clicking 'Max Bet' bets five coins and deals the cards. 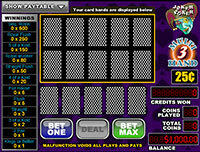 Draw Deal - Deals the cards after a bet has been place or after cards have be selected to be 'held'. Hold - The player clicks on the cards it wishes to keep. Cash Out - Click on the red 'Cash/Out' button to stop playing and cash out your credits and winnings. Payouts are based on the pay table. 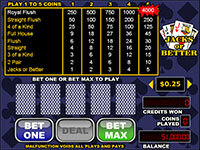 Each Video Poker game that consists of three or more hands can be played for $0.01, $0.05, $0.25, $0.50, and $1. 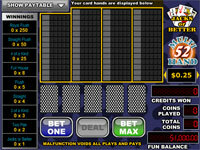 In addition, players can choose from 3 hands, 10 hands, 52 hands or 100 hands. If you are playing a game that consists of three or more hands, you can click on the 'Pay Table' button to view the payout table and the proper column will be highlighted based on the amount of coins played. Bonus Poker is a game of draw poker. The player receives five cards from the dealer; the player then chooses which of the cards to keep or "hold". Then discards the remaining cards for new ones by pressing deal. The final hand is determined a winning hand if the player has a pair of Jacks or better. There is a special payline in the paytable for 4 of a kind. Player has the option to discard up to five cards. Please see the paytable on the current machine for more information. The final hand is at least a pair of Jacks. Bonus Poker Deluxe is a game of draw poker. The player receives five cards from the dealer; the player then chooses which of the cards to keep or ?hold?. Then discards the remaining cards for new ones by pressing deal. The final hand is determined a winning hand if the player has a pair of Jacks or better. There is also a special payout for having 4 of a kind. Draw Deal - Deals the cards after a wager has been place or after cards have be selected to be 'held'. A draw poker game that starts with 5 cards dealt. Chose which cards to keep and discard the rest for new ones by pressing �deal�. You win if you have a 3 of a kind or better. Get a special payout if you have a 5 of a kind, Wild Royal with 2s, or 4 Deuces. 2's are wild and can be used to make other winning hands. 5 of a kinds and Royal Flushes using a wild 2 get a special payout. Double Bonus Poker is a game of draw poker. The player receives five cards from the dealer; the player then chooses which of the cards to keep or "hold". Then discards the remaining cards for new ones by pressing deal. The final hand is determined a winning hand if the player has a pair of Jacks or better. There is a special payline in the paytable for 4 of a kinds. Double Double Bonus Poker is a game of draw poker. The player receives five cards from the dealer; the player then chooses which of the cards to keep or "hold". Then discards the remaining cards for new ones by pressing deal. The final hand is determined a winning hand if the player has a pair of Jacks or better. 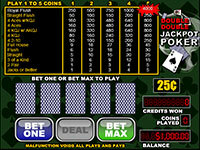 Double Double Jackpot Poker is a game of draw poker. The player receives five cards from the dealer; the player then chooses which of the cards to keep or "hold". Then discards the remaining cards for new ones by pressing deal. The final hand is determined a winning hand if the player has a pair of Jacks or better. Double Jackpot Poker is a game of draw poker. The player receives five cards from the dealer; the player then chooses which of the cards to keep or "hold". Then discards the remaining cards for new ones by pressing deal. The final hand is determined a winning hand if the player has a pair of Jacks or better. There is a special payline in the paytable for 5 different 4 of a kinds.